Leia returns to Alabama to put her grandmother's affairs in order, clean out the big Victorian that has been in the Birch family for generations, and tell her family that she's pregnant. Yet just when Leia thinks she's got it all under control, she learns that illness is not the only thing Birchie's been hiding. 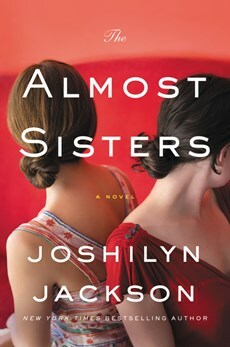 The Almost Sisters by Joshilyn Jackson was an amazing read. So many layers to it, with a variety of characters that embody so much of southern USA still today. Leia is a graphic artist and novelist, she is talented and made her way in this world really well. She has created her own work in a graphic novel about Violence and Violet. It has been a huge success but now she is not sure where to turn. She is meant to be writing a prequel showing the origin of Violence but she can't quite get there, nor can she proceed with a further story because she so violently finished off the novel. Who are Violet and Violence and how do they link to each other and Leia was one of the mysteries in this book. It was one of the questions that held my interest all the way through. Leia has a sister Rachel, well they are step sisters - almost sisters, Leia's Dad died early and her mother remarried, however small Rachel was adamant Leia was not going to call Rachel's father - daddy. The theme of fatherhood and its importance runs through the book, echoed in a number of places. In one place we have Lavender, Rachel's daughter who is lost to her father at present as her mother has thrown him out of the house. Lavender needs her dad. And of course we have Leia pregnant with new life, but no daddy. And that's upsetting especially for Lavender who is determined to do something about it. That's not the only place fatherhood is examined, but no more, because to mention it would be to spoil it for readers. As well we have two wily old women, Birchie - Leia's grandmother and Birchie's best friend Wattie. They tell a story of the south and how white and black people integrate or not, its a story of great sadness and also of hope. Theirs is a tough story but a brave one and is a very important part of the book. Leia walks right into a mystery that is about to blow right up. I was drawn right from the beginning with this book and found it an absorbing read, while heartbreaking at times, the bond of love and loyalty wins through. It is confronting and highlights the issue of racism that will no doubt leave a mark on any open and compassionate heart. I'm glad you loved this. I enjoyed Someone Else's Love Story by Jackson. I'm going to add this to my list. Thanks for your terrific review. This one sounds like a fantastic read. I've been wanting to read this author forever and might start with this book. Sounds good; I like southern chick lit. I just downloaded this book today. I can't wait to read it, as I love the author...and your review pulled me in. I enjoy these issues! I really enjoyed this book...it was the first by Ms. Jackson. I've heard really good things about Joshilyn Jackson and have been wanting to try a book by her though I'm always a little hesitant to read books set in the south. I do love the sound of this one and with your positive review I think I'm going to have to try it! Thanks for sharing! Loved this one too! I think I've read all but one of her books, and this may be my favorite. Ohh.. I Want This One.. This is definitely on my Audible wish list - she's one of the few authors who does a fabulous narration of her own books. Loved your review. Wow can you say DRAMA ;-) thanks Kathryn!